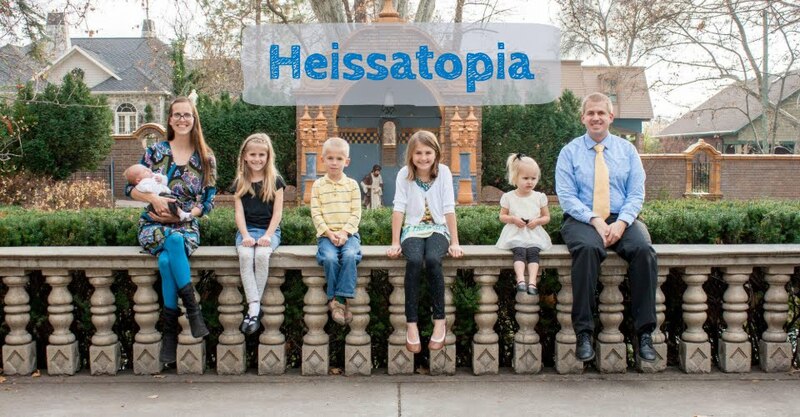 Heissatopia: Welcome to the Jungle! Rachel's mini-musical came *this close* to being postponed again due to inclement weather on Tuesday night (this time for a severe storm system, not a snow storm) but we were fortunate and the weather cooperated and the show was able to go on. Arriving twenty minutes early was apparently too late. The gym was packed and the only reason we got seats was because Becky—a friend from church—had saved some seats up front but then decided she'd probably end up bouncing the baby in the back of the gym anyway (and she'd already seen the afternoon performance) so she let us take them. We got a good view of Rachel as she walked in...but that was all we saw of her. Oh. Hello, family. I will totally acknowledge your existence with the palm of my hand. We were quite impressed with how well this show was done. The kids sang wonderfully and the drama team did some fine acting. Although you can't see Rachel from this angle, you can see several of her friends: Eliza, Diego, Taylor, Meadow, Callin... We had a clear shot of all those kids...just not Rachel. At dinner (before the show) Andrew asked Rachel how long the show was and she said, "Oh, I don't know. Long. Two hours, probably." It was approximately 20 minutes, which was the perfect running time considering the performance started at 7:00 PM. Benjamin got increasingly restless/cuddly throughout the show, which I just thought was due to a combination of the late hour (it was getting closer and closer to bedtime by the minute) and the more than ambient temperature of the gym (it was unpleasantly warm). Each clip of video I tried to film got shakier and shakier as Benjamin writhed around in my lap more and more, jostling the camera more and more (so I'll spare you those videos). But the show was great and the air was absolutely thick with all the excitement and enthusiasm emanating from the children. We met Rachel back in her classroom and took a picture of elephant-her posing in her very favourite location—the reading corner. Before Benjamin could pull down every bin of books, we decided to head out. We had to stop by the library, anyway, and he could pull down all the books there. We went to the library and while Andrew wandered around with Rachel, helping her find her favourite authors, Benjamin and Miriam wandered around pulling picture books off the shelf and handing them to me. When Benjamin got sick of that he went over to the kid's corner to play with the toys and get a drink from the fountain. He fussed when I told him it was time to move on and I had to drag him away from the toys, which is fairly normal. Then he sat in the train and read stories with Rachel while we checked out books. He started fussing again when he was told it was time to leave and I had to drag him away from the train and out the door. It had started raining so Andrew and the girls ran to the car while I stood under the awning with Benjamin and the bags of books. Benjamin wanted to run across the parking lot after everyone else so badly, but I made him stay with me while Andrew drove over to us. I buckled Benjamin into his carseat, loaded up both bags of books, and finally got into the car myself. The ride home was fairly quiet, and it's not a long ride at all. We discussed the plan for when we got home: go inside, put your shoes away, get into pyjamas, brush teeth, scriptures, prayer, stories. We pulled into the driveway and the girls unbuckled their seatbelts. Rachel opened the side door and the interior light came on. "Um, Mom," Miriam said from the backseat. "Benjamin..."
"Benjamin...what?" I asked. "Did he fall asleep?" "No, he..." Miriam started again. "He threw up, I think." "You think he threw up?" "Yeah. I think so. He's covered in throw up, so..."
I let the girls into the house, got them started on their bedtime routine, and drew a bath, while Andrew removed Benjamin, car seat and all, from the car. When I came out of the house Benjamin was sitting on the lawn, still buckled into his carseat. "I just...can't..." Andrew said. "I just...don't... I just... What do we even do in a situation like this?" There was so much vomit. So much. It was all down the front of Benjamin, his car seat was drenched, even the rolled up towel that helps keep his carseat snuggly in place was covered in vomit (but luckily it kept the upholstery clean). "Why don't we get the hose?" I suggested. Andrew looked at me. He looked at his sad, pathetic, sick, sick baby. He looked at me. He looked at the baby. He looked at me. He looked at the baby. He looked at me. "Not for him! For the carseat!" I said. "Oh, okay," Andrew said. "Got it. I thought you meant we should spray them both off and I wasn't sure spraying a sick baby with cold water was really a good idea." "No," I agreed. "I already ran a bath for Benjamin." "How do we even unbuckle him?" Andrew asked. I grabbed a dry part of the towel and undid the buckle. "Now, take your arms out," I instructed Benjamin, who is usually undesirably skilled in extricating himself from those straps. He sluggishly obeyed. We were then faced with the dilemma of how to get his clothes off. They were drenched. "I'm sorry, buddy," I apologized, as I pulled his shirt off the usual way—right over his head—there was no other way to get that thing off. "Oh, that's the worst," Andrew said, watching the vomit-soaked fabric envelope Benjamin's head. Little did he know, there was a storm coming—a storm that was even worse than having vomit-soaked fabric pulled over your face. I gave Benjamin a bath while Andrew hosed down the carseat and the towel from the car and Benjamin's outfit. Benjamin was pretty cheerful after his bath. We were just gathering for scriptures and prayer when Benjamin ran into my arms. "Momma!" he said, jumping onto my lap and collapsing into my arms. "Hi buddy!" I said, giving him a hug. Then he turned to me with a look of panic in his eyes. He burped. He gurgled. He covered the two of us with vomit. He threw up eighteen times before we finally got some zofran at the ER (more on that later) so instead of everyone oohing and ahhing over Rachel—our little elephant star—before bed, everyone was worrying about Benjamin. Miriam's been singing the songs nonstop since watching the show (and we've only seen it once). They're pretty catchy songs! Actually, this reminds me of how when Rachel was around 2-3 years old she'd answer elephant when asked what she wanted to be when she grew up. I thought of Rachel's elephant show not long ago so I'm glad to read that they finally had it. She looks so cute! I'm soooo sorry Benjamin has been sick though. Poor baby. And poor mom and dad.